At one time or another, even carefully maintained refrigeration systems still experience problems, when that happens we respond, often within one hour. 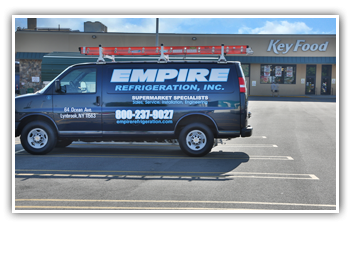 Since 1985 Empire Refrigeration has been a trusted resource across Long Island and throughout the five boroughs in the installation and maintenance of supermarket refrigeration systems. While considering technological advances and current industry standards Empire Refrigeration can meet your budget needs and time frame for your new construction project or renovation, either large or small. We specialize in providing our clients with the most energy efficient and environmentally friendly parallel rack refrigeration systems available. Providing a full line of state-of-the art, energy efficient and environmentally responsible supermarket refrigerated display case units from two leading major manufacturers Arneg and Zero Zone. Empire Refrigeration can supply you with all your supermarket refrigeration equipment needs such as refrigerated cases, walk-in boxes, rack systems & shelving. Our preventative maintenance service of existing refrigeration systems makes up the bulk of our customer base, and we pride ourselves in knowing that our long time supermarket customers rely on the dependability and quality of our specialized preventative maintenance and repair services. Some of our satisfied customers include AFB Supermarkets, Associated Supermarkets, Brooklyn Fare, C-Town, Compare Foods, Key Food, Fine Fair, Food Dynasty, NSA Supermarkets and Pioneer. © 2015 Empire Refrigeration "Supermarket Specialists"